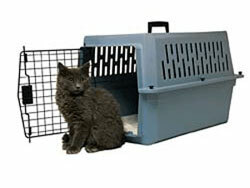 Make sure you have a cat box or carrier that is secure and big enough for your cat. Do not allow the cat to roam free in the car. You run the risk of distracting the driver or the cat escaping when you open the door. Many cats run as soon as the carrier is produced so try to acclimatise your cat to it by leaving it around the home, maybe put in some cosy bedding and your cat will use it as a den, or create positive association with the use of favourite toys & treats. Do not feed your cat for at least 4 hours before the journey. Make sure you line the carrier with newspaper as many cats can have an accident while travelling. Place the carrier on the seat of the car and run the seatbelt through the handle on top to secure it. If your cat meows a lot during the journey don't worry, he's just voicing his displeasure. Don't be tempted to stop and let him out. Once he arrives here and is let out of the box he'll feel much better. If you intend bringing your cat to the cattery on the morning of the day you travel, don't let him out for his morning constitutional. He may have noticed you packing etc & figure something's up and run for cover!